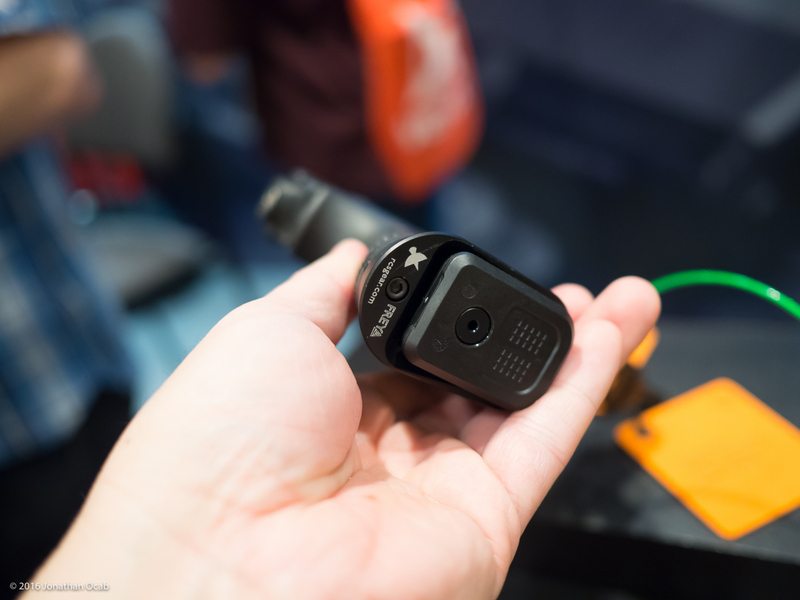 If you read Part 1 of my 2016 SHOT Show After Action Report, you are aware of the fairly uninteresting announcements (in my opinion) by Glock at this year’s show. But that is not to say I didn’t find an interesting Glock related product that I am going to acquire when available. 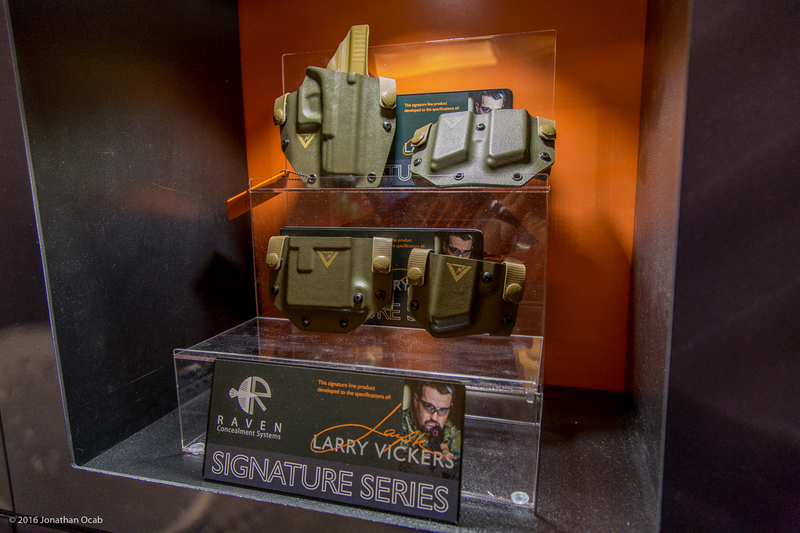 Raven Concealment Systems, best known for their kydex outside-the-waistband (OWB) Phantom and Phantom LC holsters, showed off some non-holster products they are going to make: the Balor mount and the Freya magwell. 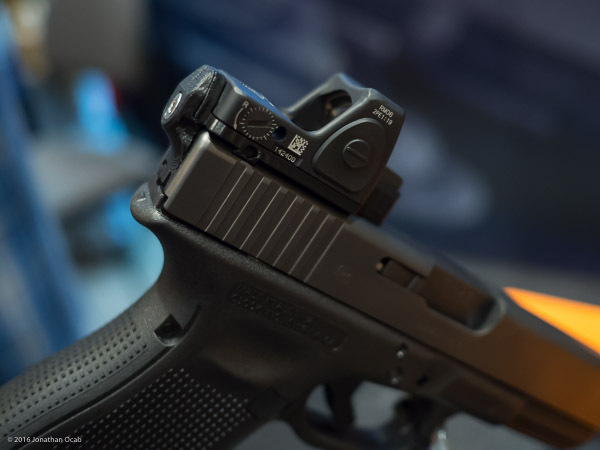 The Balor mount is essentially a Glock slide mount for a micro red dot, but is “no-gunsmithing” required in that it does not require any slide milling or drilling/tapping to install the mount adapter. The Balor mount slides into the existing Glock rear sight dovetail and the rear part of the mount actually integrates into the slide where the rear backplate would be, replacing the backplate. 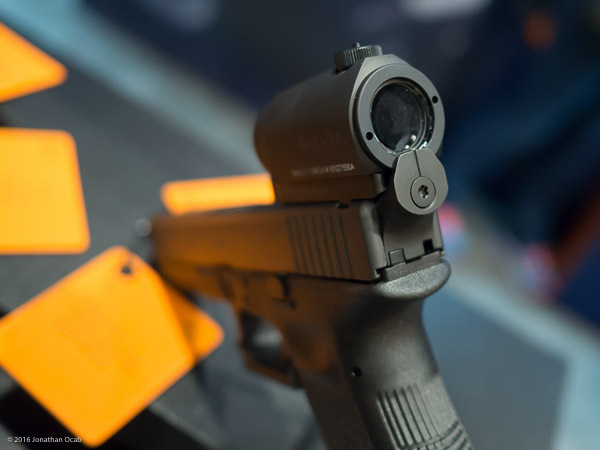 Since this requires removal of the rear sight, the Balor mount also has some backup sights integrated into the mount, which cowitness with the red dot. 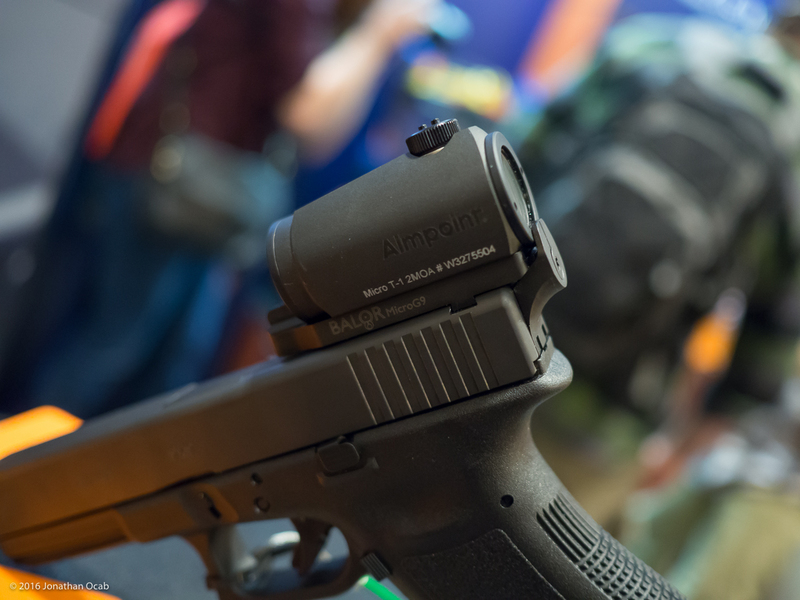 This is an interesting option for those that have a non-MOS Glock and don’t want to mill a slide. The Balor mount will be available for both Aimpoint T-1 (T-2) and the RMR sometime in April/May 2016. 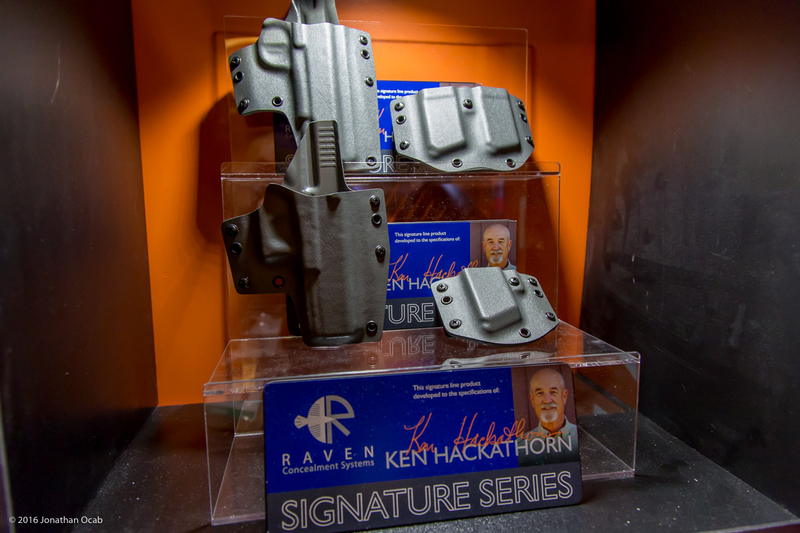 But the more interesting non-holster product at the Raven Concealment Systems booth is the Freya magwell. There are already plenty of magazine wells for the full size Glocks (e.g. 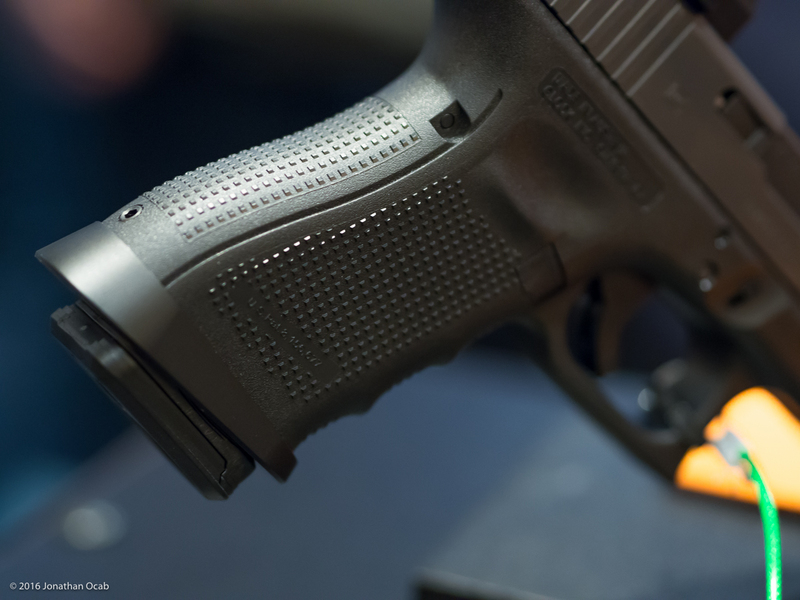 G17, G22), but the magwells for the G19/G23 are few and far between. But RCS is answering this by introducing the Freya magwell for both the Gen 3 G17 and G19 size frames, and Gen 4 G19 size frames. The Freya magwells should also be available sometime in April/May 2016. I will personally be buying one for each the G19 Gen 3 and G19 Gen 4. 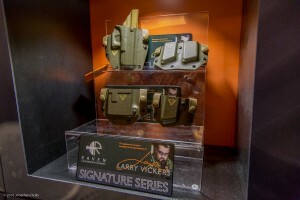 There was one issue I inquired the representative at the RCS booth about and that is a drop leg holster option. I basically want a way to adapt my existing Phantom LC to a drop leg offset. Since I’ve been experimenting with shooting while wearing a plate carrier, I’ve found the Raven Concealment Systems Phantom LC a bit hindering, and just need a few inches of drop offset to help clear the bottom of the carrier. I was told that they have been experimenting with options and are still pursuing possible options for a drop offset or drop leg solution. While I am invested in RCS holsters (I have three Phantom LC holsters), I might actually get one of the recently released G-Code OSL RTI holsters and use it with their drop offset belt mount or the MULE drop leg offset platform. 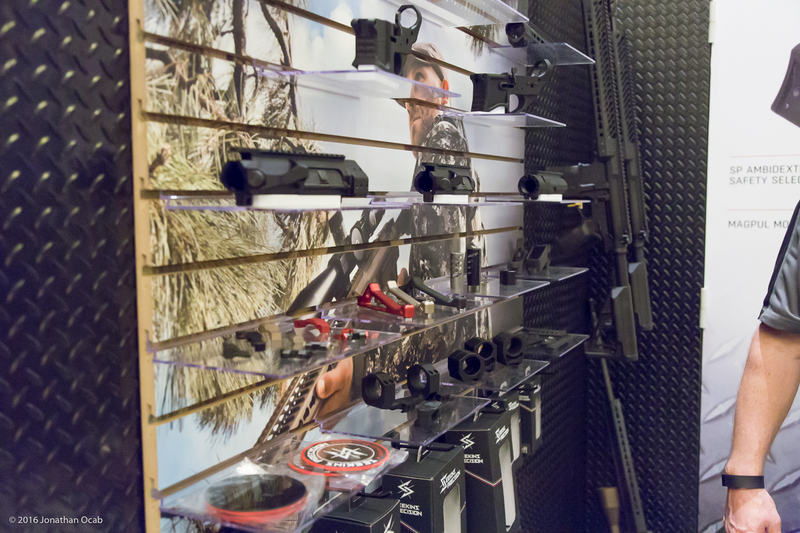 2016 SHOT Show was filled with various AR firearms and accessories, just like last year. I really think the AR market is thoroughly saturated and am not very excited at all by large majority of AR product announcements at this point. 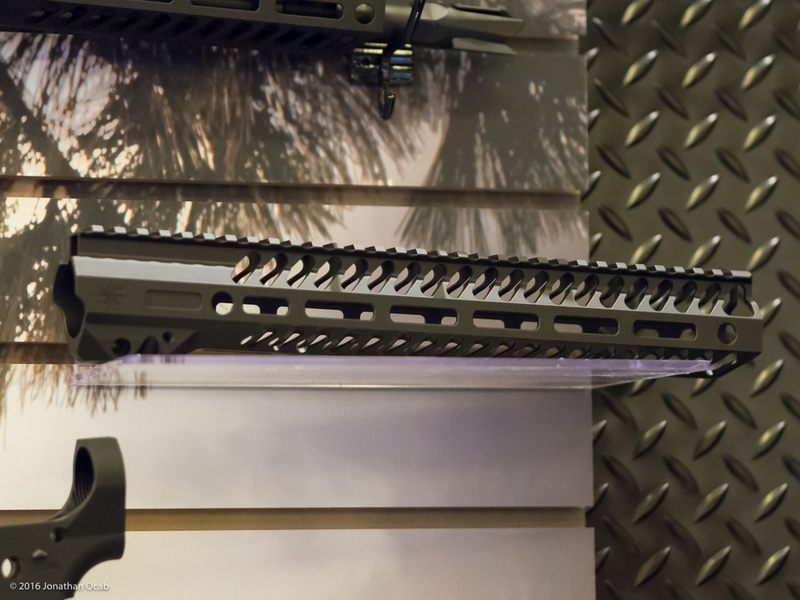 That being said, I got to handle the Seekins Precision NOXs handguard, which was actually debuted last November. While I use very little of Seekins Precision’s products (billet trigger guard, 60/90 degree safety selector), I do respect their product line since they make quality kit. 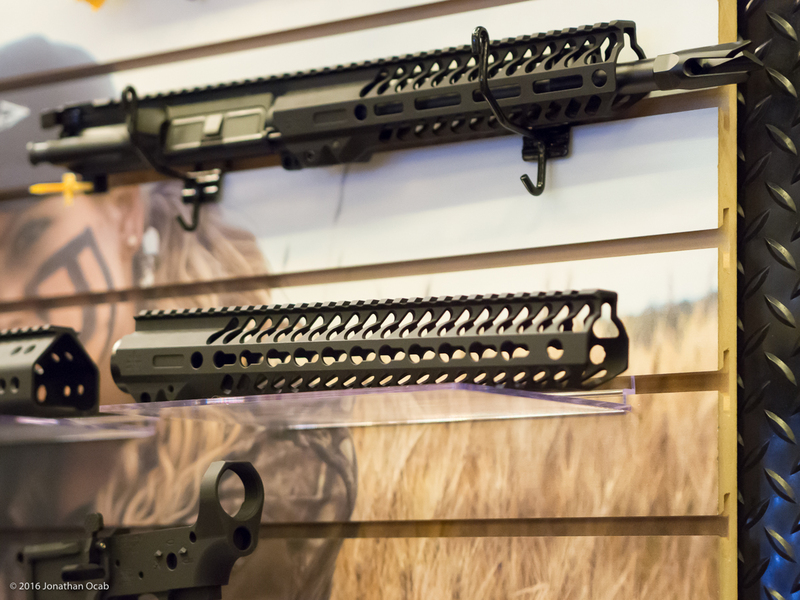 The NOXs is something that intrigued me not because they make it in both Keymod and MLOK, but because they make the NOXs in dimensions that rival the Bravo Company Manufacturing KMR (Keymod Rail), which is arguably the best lightweight handguard around (and the one I personally use). My 13″ BCM KMR weighs 7.7 ounces (including the barrel nut and mounting hardware), with a 1.3″ inner diameter and 1.5″ outer diameter, which is pretty unrivaled right now. 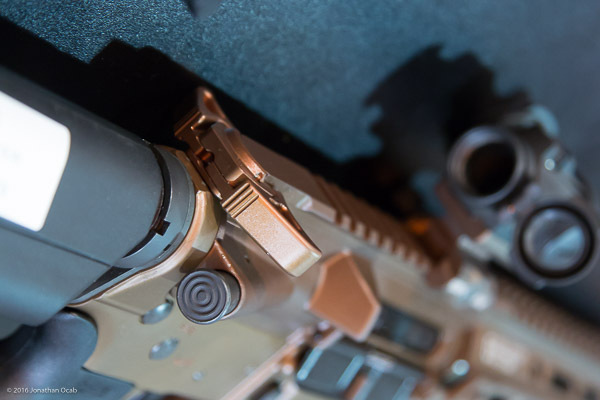 But the anodized aluminum 12″ (12.875″ overall length) Seekins Precision NOXs comes close at 10.6 ounces with the mounting hardware, and with a 1.350″ inner diameter and 1.5″ outer diameter. 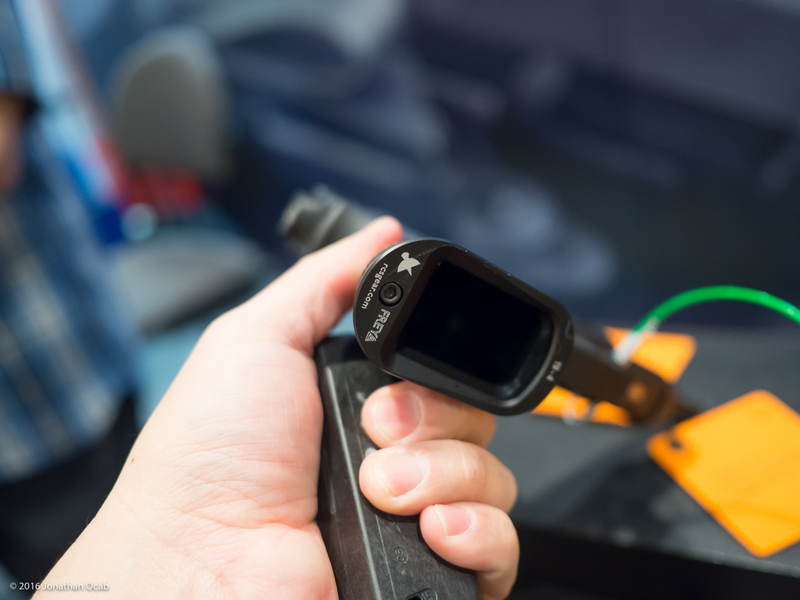 Note that the 13″ BCM KMR Alpha, which is made out of aluminum and not the blended aluminum and magnesium alloy of the original KMR, comes in at 9.9 ounces. Holding the NOXs, it has a very nice contour to it and feels like holding a BCM KMR. So while the BCM KMR is still my favorite handguard when it comes to a Keymod handguard, if and when I decide to build a rifle with MLOK (or switch to MLOK), I think I will be going with the Seekins Precision NOXs. I anticipate the NOXs will become one of the more widely used MLOK handguards as people become more aware of its light weight and form factor. 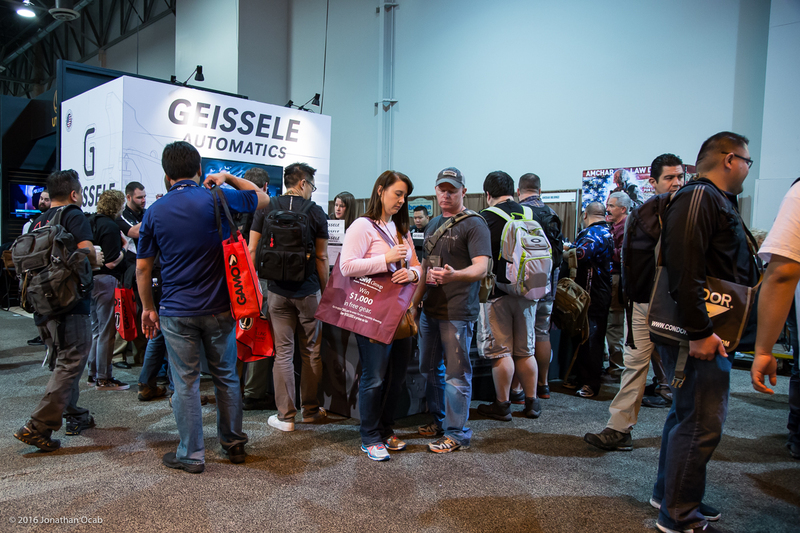 Naturally, I visited the Geissele Automatics booth to check out their pre-SHOT announced charging handles. 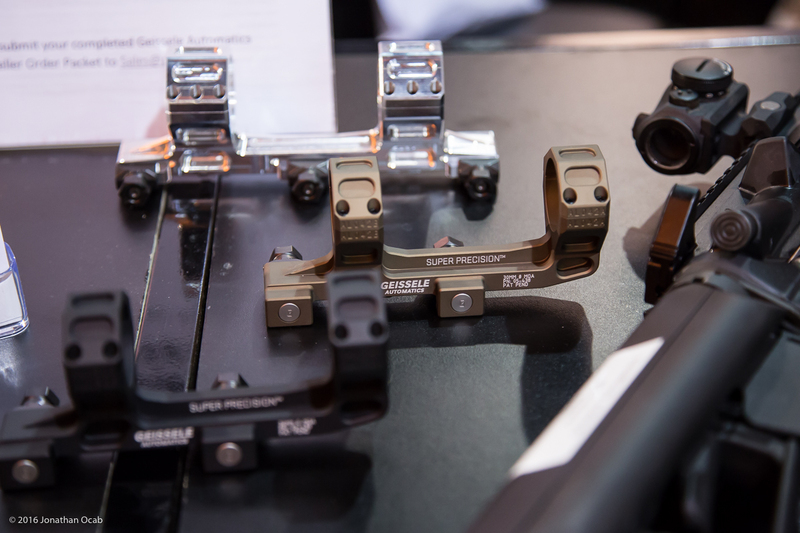 Sadly, I was a bit disappointed to discover that they are not yet in production, even though Geissele announced the Super Charging Handle pre-SHOT. The Geissele SCH and the Geissele Super Precision scope and T-1 mounts are slated for a 2016 release, but no definitive timeline. 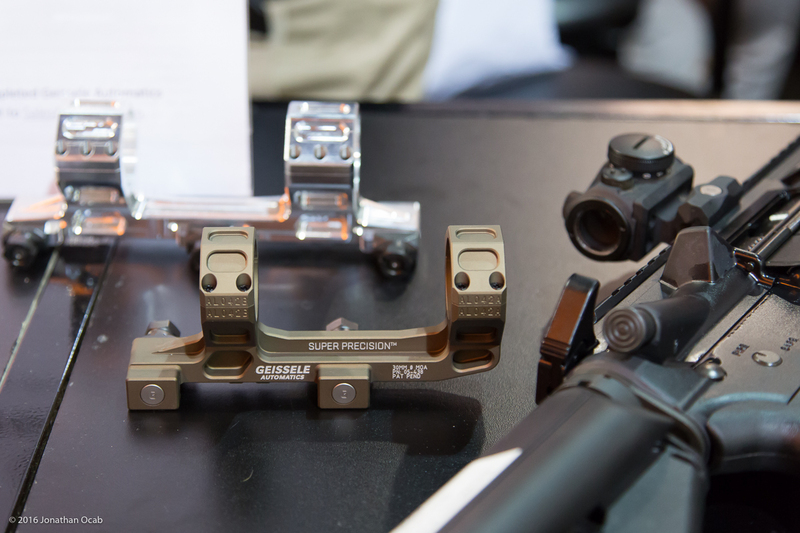 Handling the Geissele Super Charging Handle, it seems to function well from an ambidextrous standpoint. I operated the handle to pull the BCG back using the latch on each side independently and it was smooth and didn’t hang up. I’m still using my BCMGUNFIGHTER Charging Handle MOD 4, and never went with the AXTS. I’m a huge Geissele fan, so I’m going to shell out the money to put one on my rifle, anyway. Estimated price is going to be $100, give or take, and add $10 for the DDC (Desert Dirt Color) finish. Viking Tactics is very well known for their popular VTAC two-point sling, but also for their instructional and training videos, books, and classes. The Viking Tactics barricade has become a commonly utilized training tool at ranges all over the world. 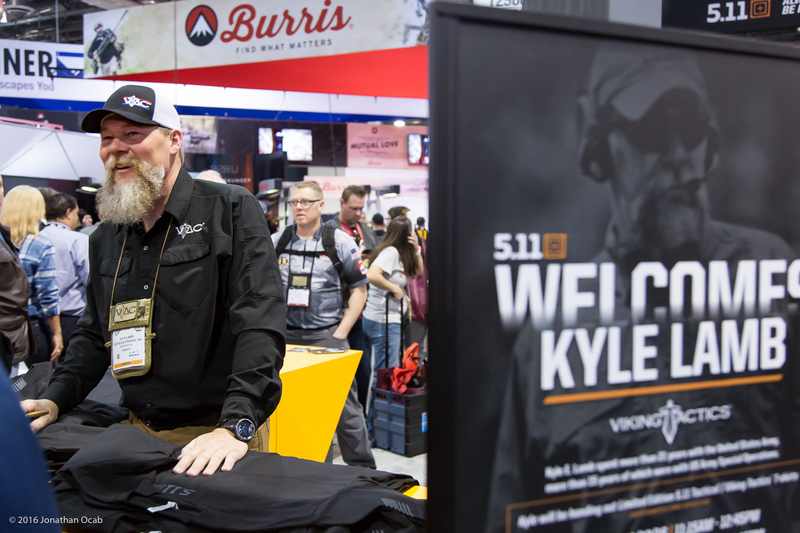 At this year’s SHOT Show, Kyle Lamb of Viking Tactics did a meet and greet at the 5.11 Tactical Booth giving away a limited edition SHOT Show exclusive 5.11 Tactical / Viking Tactics t-shirt. 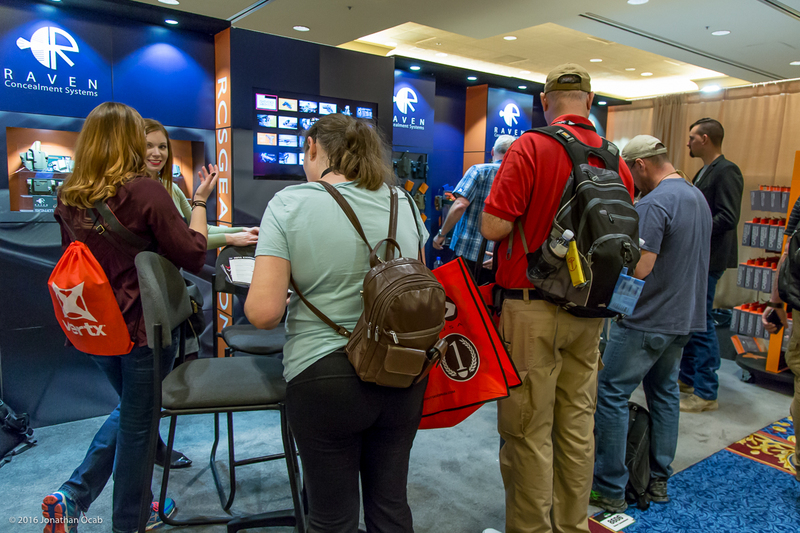 Visit the site again soon or follow my Twitter or Instagram feed to read Part 3 of my 2016 SHOT Show After Action Report which should be posted shortly. 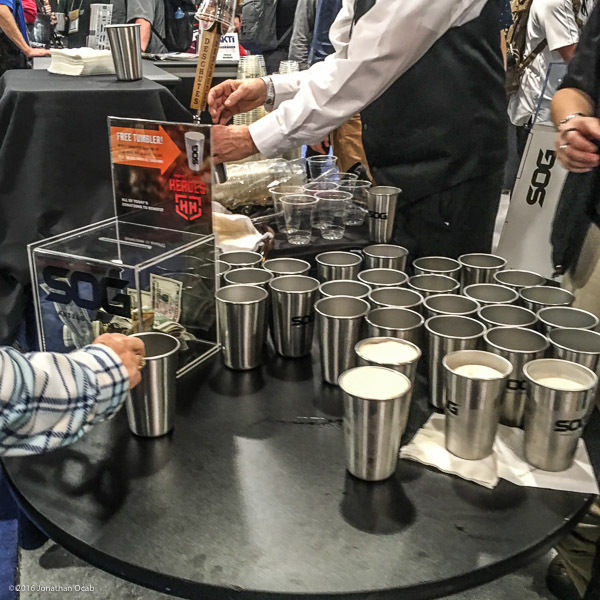 Shout out to the SOG Knives booth for giving away free beer, and doing the optional $5 donation to Home with Heroes for a free SOG Knives metal tumbler.